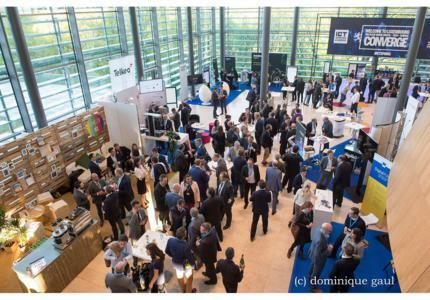 On May 9th and 10th, more than 5,000 of professionals gathered at the European Convention Center Luxembourg to discuss the latest tech, space, FinTech and digital trends. During two days, the ICT Spring 2017 speakers’ wondered how the digital technologies could change and improve our way of life through four conferences: Entertainment superpowers, Blockchain cross industry, Digital transformation and The Future of mobility. Then, Olivier Shaack, the Creative Director of the famous French private channel CANAL+, presented: “Creative Happiness Therapy”. With different videos illustrating emotions, Olivier Shaack showed the importance of TV to create new experiences and moments of happiness and grace. According to him, the perfect TV spot has to make you laugh and dancing because “Music is essential to a great spot and we have to laugh everyday”. It took as an illustration Don’t Stop Me Now by Queen, the most feel-good music of all of time. To continue this session, the next question was "How digital technologies could help marketers and companies to sell their product?". To start, the Former studio marketing manager of the Walt Disney Company, Anne-Claire Le Conte recounted “The story behind our storytelling”. The famous samples mentioned were the “Once upon a time…” and the legend of Steve Jobs’ garage and the beginnings of Apple. If we all love stories, it’s because that connects us with our humanity. Indeed, in marketing, a good story precisely adapted to the public is the first rule to keep its attention. Anne-Claire Le Conte explained that the most interesting in the storytelling is the story behind the legend. And what could be better than new digital technologies to tell stories by offering new experiences to customers? That is what M. Bernard Michaux, associate at SAMSA Films in Luxembourg, explained through the examples of virtual reality and augmented reality, the two burning and trending topics of the moment. According to him, ”if you have a good idea, technique won’t kill it”. Today, augmented and virtual reality disturb all content. If they still use traditional media, companies need to adapt their advertising to be the most competitive. Companies have to be creative and over-reacting all the time and, of course, “create a true story to make difference”. M. Thomas Petersen, Brand Development Director at Ubisoft, can only agree. The development of virtual reality in video games is part of their digital strategy. The improvement of this technology is then necessary to innovate and evolve. That is what Julie Demarigny, Vice President International of Warner Bros, explained during her speech about “How data transforms our business”. From 2010 till present, she retraced the evolution of our data’s behavior and its impact on the movie market. For example, we began using data by sending emails and newsletters because it was cheaper and easier. Then, with social networks, the movies websites were slowly transformed into Facebook pages. In 2016, 74% of our emails are not opened. As she said: “more and more we realize that our traditional way of buying digital media is not efficient”. So they moved from traditional media buying to targeted buying. Instead of buying the audience of publisher that is in line with their target, they target different audience targets at market value. Then Marco Houwen, Project leader at Infrachain in Luxembourg, addressed: “Infrachain from proof of concept to operations”. Infrachain aims at leapfrogging the adoption curve of blockchain by creating a compliant-ready community/permissioned node blockchain infrastructure. Based on the fact that it exists in the public chain trust and responsibility in nodes, sustainable operating environment, regulatory security and interoperability, Infrachain proposes a program based on cross-industry effort aiming to provide disintermediation services to all aspects of the economy (Fintech, Healthcare, Public services, Supply chain management...). David Foy, International Business Development manager at POST Telecom for Business, presented: “Digital Transformation: Getting into Top Gear”. The main idea of his speech is that digital transformation is cultural, no technical. Technology is all around us. As he said, if we take a look on our work environment, our home environment, at the ecosystem, all attitudes change and it is not about to learn. David Foy called it the “culture of adoption”. In fact, we use technologies for simplify our life. Because it is easier to click on our smartphone, call an Uber, pay and take the ride. Also because we share and use data at every moment of our life, processes and security need to be challenged. All people have synchronizing objects but it’s very important to know: connecting to whom? There are current subjects such as "who is making data", about the right to be forgotten, about information we get when we order a pizza on internet, etc. We need to avoid overkill. To conclude, David Foy reminded that we have to embrace change. Digital technology is also an opportunity to develop emerging countries' economy. Elyes Jeribi, CEO of Smart Tunisia, a program promoting Tunisia as a Technology Destination, presented “Your business partner for Europe, the Middle East and Africa”. The Smart Tunisia project is to connect all Tunisia population. Smart Tunisia program is promoting real available talent, vibrant fin tech, and data center. At least European companies, Middle East companies and Africa work together for great results. Benoit Hucq, Managing Director of the digital agency of Wallonia presented the "Plan Marshall 4.0 wallon". Because digital technologies integrated new economic and territory dimension, this plan is the corner stone of the economic policy of the Walloon regional government to boost wallonia in a new era where innovation in crucial sectors is fueling the regional growth. The global vision of the government is making Wallonia a connected and smart territory, where digital companies are recognized as global leaders and drivers of a successful industrial transformation, and where digital innovation works for high quality education, open public services and the well-being citizens. Then, the Regional General Manager of Northern Europe of the famous tech company Uber, Jo Bertram exposed “How to reduce car ownership and increase mobility” thanks to digital technologies. She explained that the main issue is not the car itself, is the way we use it: individually. But they are already seeing proofs to individual car ownership begins to change. When people are given an affordable, reliable alternative they’re happy to take it. Ms. Bertram showed how traffic in big cities is complicated, bad for environment and a waste of time. But in a strange way, even in cities where common transports are well developed, as New-York or Paris, people continue to use their own car. But as Jo Bertram showed that sharing one's car represents many advantages: less CO² emission, less car accidents, and at least, it facilitates traffic in the city. These are the many reasons to adopt this new way of mobility.